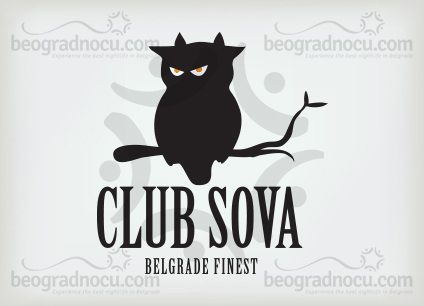 Club Sova is one of the oldest club in Belgrade. It's located in downtown at Topličin Venac, No 18 Gračanička Street. Otherwise, part of town known for best nightlife in Belgrade. Who remember club Sova, from the end of nineteens, in that time the most popular club in Belgrade, will be amused since at the same place is reopened new club with same name. Main characteristic of club Sova is that it's contained from several parts which are connected in one compact unit. This gives a special charm and originality to this club. Interior is sophisticated and modern, like the most famous wide Europe. Excellent surround system, professional and polite staff, makes the atmosphere in this club positive and seductive. That's precisely, why guests of this club are either local people either foreigners, tourists. When guests come here for the first time, they always come back, since this club fulfill their high standards. Music program is primarily based on soul, funk and disco sounds with most wanted Djs. Club is opened on Wednesdays, Fridays and Saturdays and every day is a different story. Average age in club Sova is 25+.